Prime Day 2018 is right around the corner but you definitely don’t need to wait until mid-July to score some serious savings on Amazon. Today’s sale on the wildly popular YI Dome Camera is a perfect example. This top-rated home security camera pans, tilts, and zooms, and it can be controlled remotely using the free iPhone or Android app. It also has an awesome motion tracking feature that keeps automatically keeps the action in view by following any movement on its own. 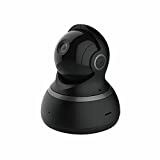 Use the coupon code 2V3O5G4V at checkout and you’ll score this awesome wireless camera for just $40.99!